WorldGuy's Walk for Diabetes Awareness -: I have been to the mountaintop. 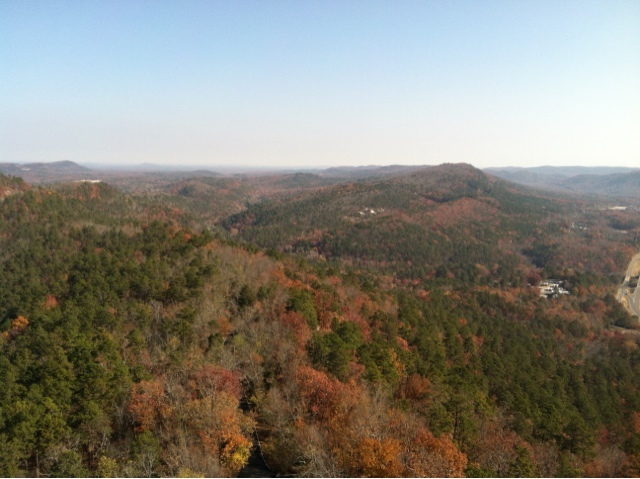 I took a drive to the top of Goat Mountain and even rode the elevator up the observation tower above Hot Springs. Before that I met up with a woman who had stopped the previous morning as I was readying to walk for the day. The purple van had caught her eye and the blue and green world tied to it was too much to resist. She brought me a small bucket of quartz crystals her late husband, a Native American had collected. West Arkansas is not only famous for its hot springs but it's rich crystal deposits and as I walked through the state II asked people about it. Some told me that Goat Mountain has been a place where native Americans revered as a place of spiritual importance. A short time before I arrived a large number of of locals and natives had gathered there for a hand-holding-moment to bring a sort of healing to the world. I was late for the "moment" but felt the healing power, real or imagined, of the area though the mountain was long ago taken from the Indians and was now part of the national park system. As with all the parks I have visited the throngs of visitors and necessary development have helped to both trample and preserve the beauty. Over the miles and years I have met those of many faiths by the side of the road. There is no denying the power of nature, whatever force I believe creates , assists and maintains.